I think I've mentioned before that I love short story anthologies, especially by well-established authors in the field. They're great because I don't end up spending an entire day reading instead of doing chores and homework and other necessary stuff. Short stories = quickly wrapped up slices of interest that send me back on my way.Of course, I still love long books, I just often don't have the time. The difficulty with short story anthologies is finding absolutely brilliant, thought-provoking ones that showcase both up-and-coming and established authors. It can be a bit of a gamble.Bangs and Whimpers delivers on all fronts. 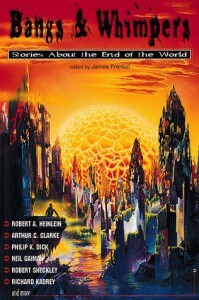 Every time I've started to tell someone about this book, intending to tell them about just one short story in particular I think they would find of interest, I find myself saying something like, "Oh, yeah, and there was this other one that explored an end-of-the-world scenario where we planted the seeds to a new creation by . 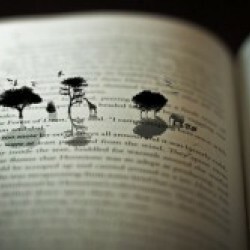 . . "This book is amazing. Each short story approached the Ending of All Things from a different vantage point and perception. Where one author chose to think that the annihilation of life on earth meant the end of life forever, another author saw a thin thread of hope in the distant future. Where one author wrote with detached omniscience, another wrote in intimate first-person. Each story has a unique style and vision, but they all have one thing in common -- they are brilliantly, captivatingly written. This book should not be missed.